Skylar’s New Wheels! | I am JuJu! ← A Bit Of Exercise! 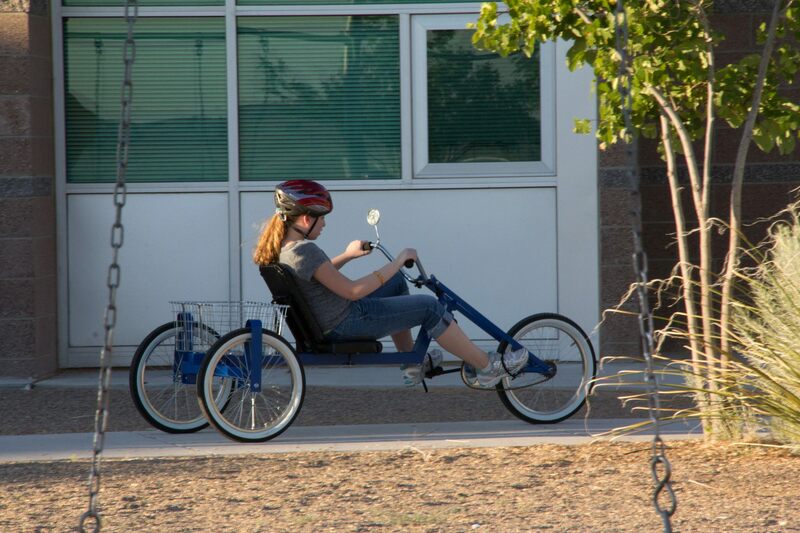 I am so excited to share with all of you that Skylar finally got an adaptive bike! 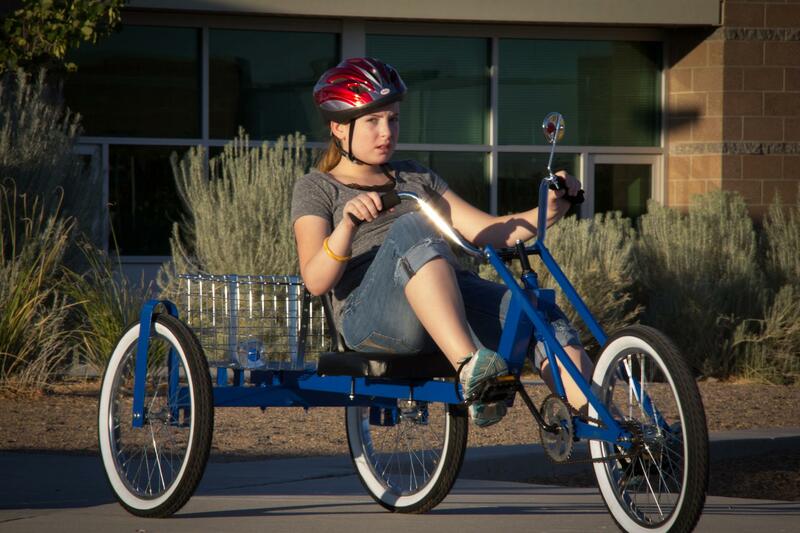 Let me share how Skylar came to be riding this fancy set of wheels! 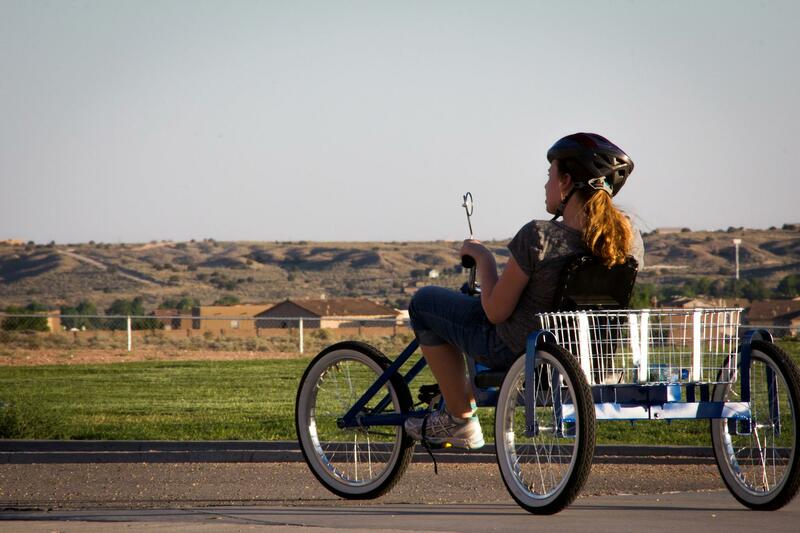 Many of you might recall that I shared here on my blog several months back about how we were trying to raise funds for an adaptive bicycle for Skylar. The bike we were originally looking at was priced at about $1,600. Shortly after writing that post I received an e-mail from a couple, Henry and Yvonne, who were in a Bible study with my parents when they lived in Virginia years ago. Both Henry and Yvonne are avid bikers and they wanted to come alongside us and help us pick out the perfect bike for Skylar. We kept in touch over the next several months via e-mail. Over the course of those few months my mom did a jewelry fundraiser and we sold autism bracelets to help raise the funds for the bike. We also had multiple people who donated money to her bike fund as well. 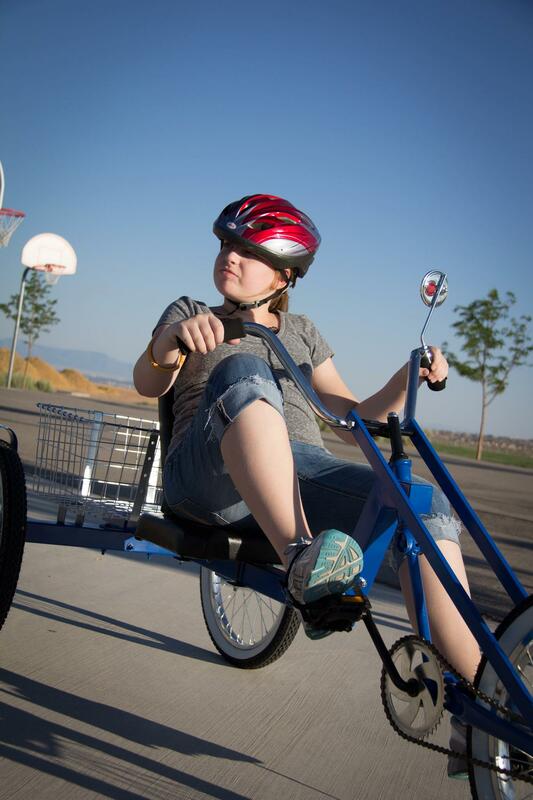 We had raised a significant amount of money and were encouraged until the beginning of May, when Skylar’s physical therapist actually priced out the specific bike Skylar needed and it was over $2,200. That definitely took the wind out of our sails! After seeing the cost of that, I told Chris that we needed to specifically pray that God would provide exactly what we needed! A couple of weeks later while I was in Tucson, I received another e-mail from Henry and Yvonne. Henry told me about a gentleman, Bill, that he had read about on one of the biking message boards he regularly reads. 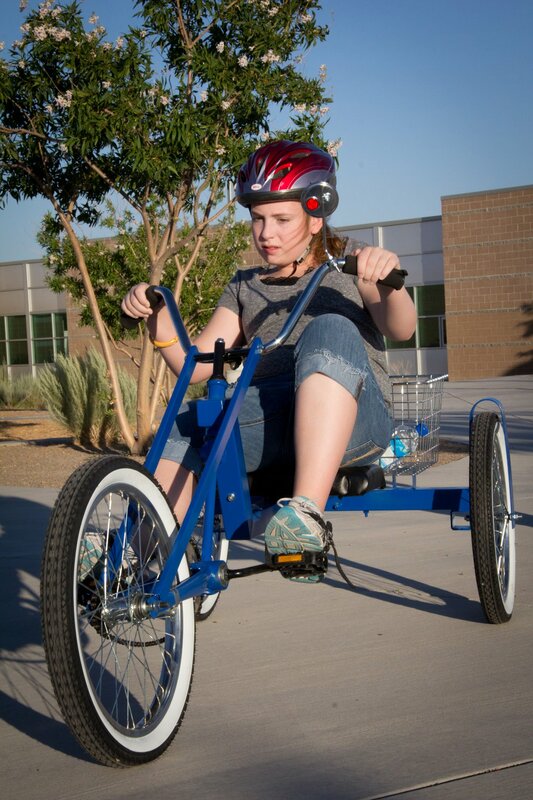 You see, Bill has a passion for biking and a heart for individuals with special needs. 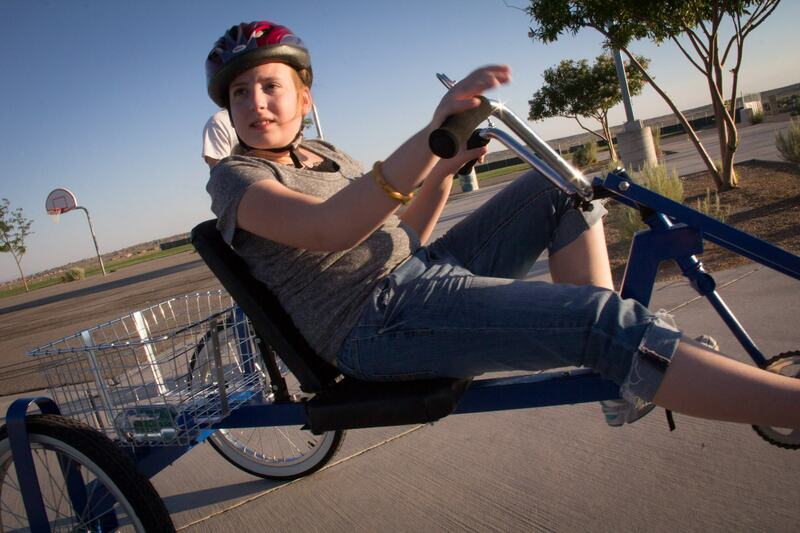 Bill had already built bikes for individuals with Autism, Down Sydrome, and Cerebral Palsy. The best part was that Bill lived in the Phoenix area which put us in pretty close proximity to him. Henry asked if I would be interested in connecting with Bill to see if he could build a bike for Skylar. Of course I said “YES!! !” and within hours I had already heard from Bill and set up a meeting for the following week. I actually sent a copy of what the physical therapist had stated she needed and information about Skylar’s cognitive delays, low muscle tone, and issues she has with her feet. I was overjoyed and so encouraged when he wrote back and said that he would be able to build a bike for her and for a fraction of the price! 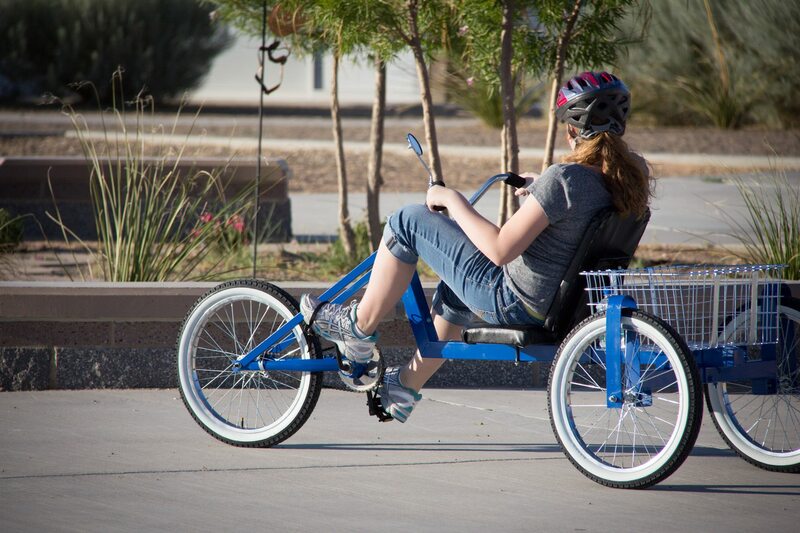 It took about 3 weeks for the bike to be built and we were so excited when we got word that it was ready for pick-up! 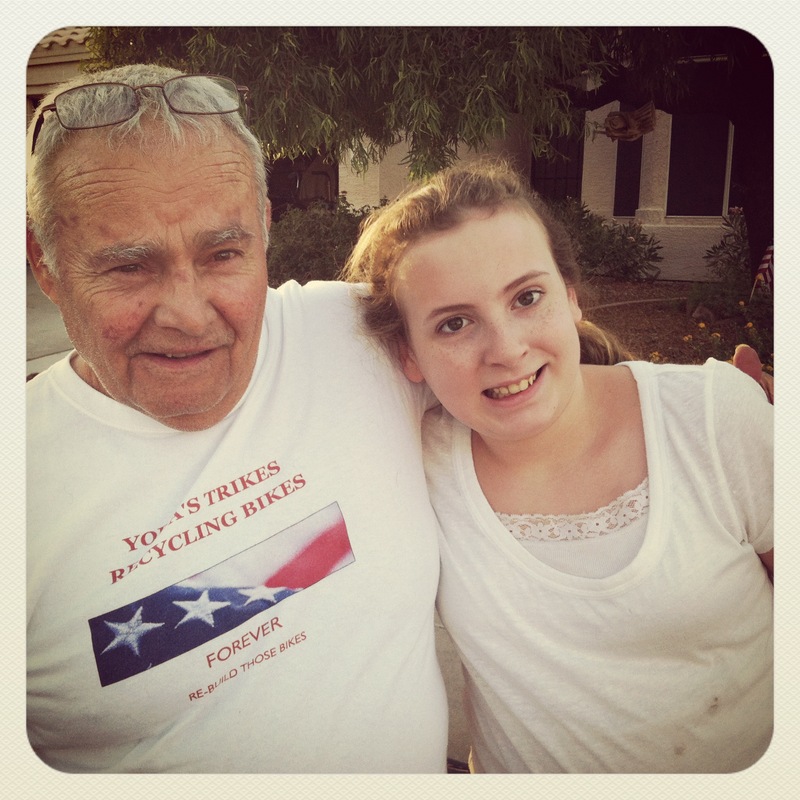 The pictures below are of Skylar and Bill, who is also known as “Yoda”, and the first time she got to ride her bike out in front of his house. I can not begin to describe to you the range of emotions that I felt as I watched her peddle her new bike around the cul de sac. Her huge smile made my heart burst! I loved hearing her words as she rode her bike. Look guys! I’m riding a bicycle! I totally love my new bike! Thank you Mr. Yoda for building me this bike! It is perfect! We left the next morning for Albuquerque and were thrilled to take the bike with us so that my parents could watch her ride. I asked my sweet friend Sara, who was my co-worker in the health office when I was the school nurse, if she would come up and snap some pictures of Skylar and her new wheels! Sara just started her own photography business, Two Brunos Photography, and I have been an admirer of her photography skills for years! If you live in the Albuquerque/Rio Rancho/Santa Fe area and want to have pictures taken, check her out! You won’t be sorry! I’m so excited to share some of my favorite photos that Sara took with you. And this is my most favorite! She was on her way back to the car and singing her heart out! It truly was just the most perfect moment! I am thankful for so many things! I am thankful for Henry and Yvonne who put us in touch with Bill! 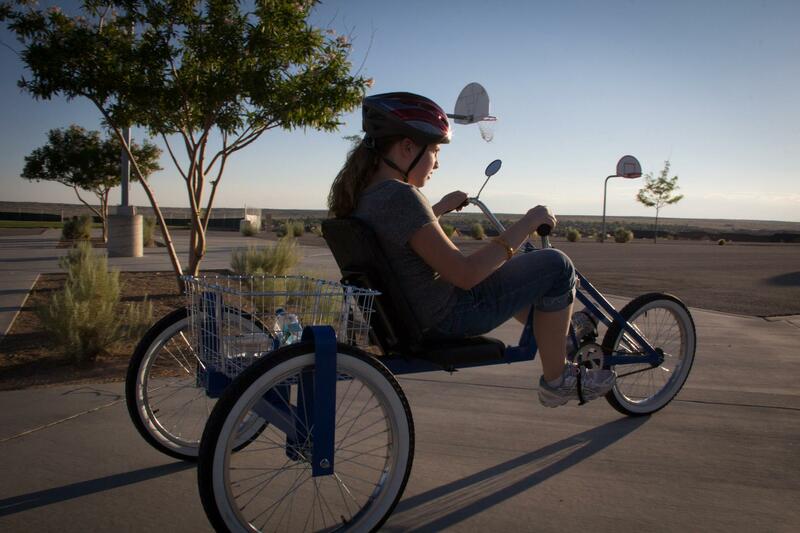 I am thankful for Bill Irvine who made our dream of getting Skylar an adaptive bike a reality! Thank you just doesn’t seem like enough! I am thankful for my friend Amy, from Ohio, who spread the word about our efforts! Her family and friends were so generous in their donations! I am so thankful for my mom and dad who continue to pour their love and energy into this sweet girl who has brought us so much joy! 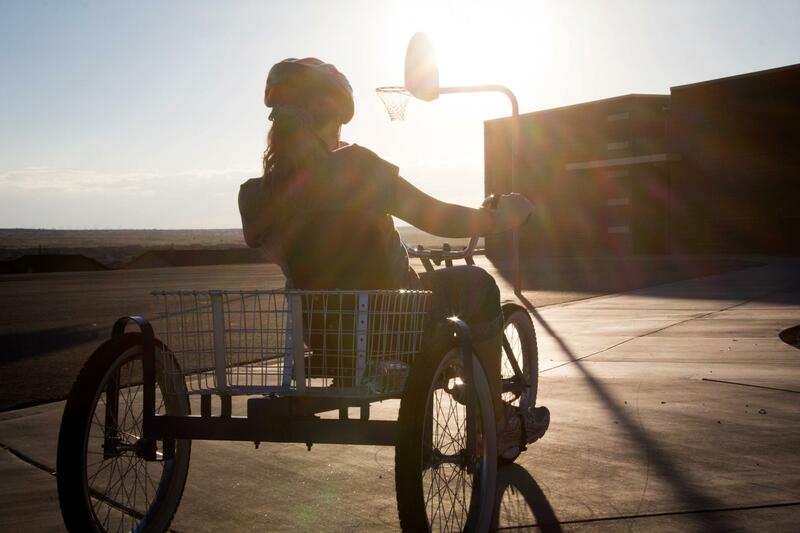 I am so thankful for Sara, who gave her time and talents to capture these pictures of Skylar and her new wheels! You can like her page on Facebook here! I am so thankful for all of you who continue to pray for Skylar and Hailey and the long journey that we have ahead of us! We couldn’t get through without all of you and those prayers! 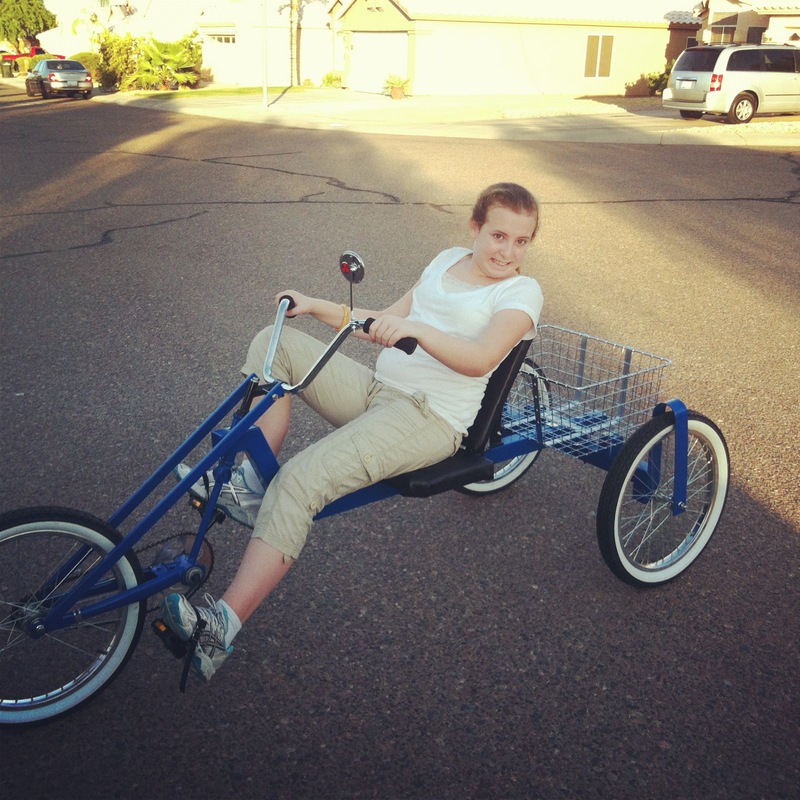 If you would like to get in touch with Bill “Yoda” Irvine regarding having a bicycle built and for pricing information, please shoot me an email and I can send you his information. You can do so by either clicking the link in the upper right-hand corner of my blog or sending me a message to iamjujublog (at) yahoo (dot) com. As always, I’m happy to answer and questions you might have. You can either leave them in the comment section or send me an email. 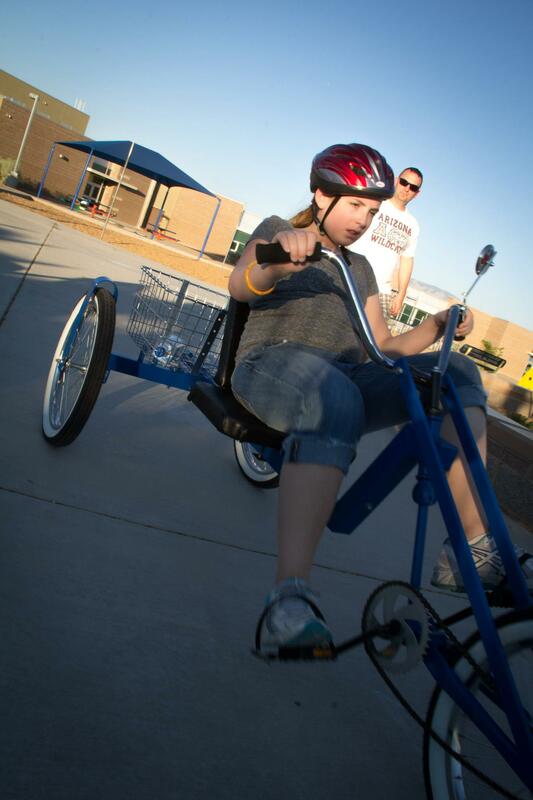 This entry was tagged adaptive bicycles, adaptive bikes, Autism, Bill Irvine, hypotonia, special needs. Bookmark the permalink. Beautiful bike for your beautiful girl! Never gets old to hear how God works these kinds of things out! Thanks for sharing with us!! Skylar. Her smile is precious in these photos! Oh Julie! I am so so happy for all of you and thankful for how God is so good to provide! Go Skylar Go! What a beautiful story. I am so happy for your girl and all of you.